Day in and day out, it’s our team that has made Chef’s Shoppe what it is for over twenty years. This awesome group of kind, hard-working, passionate professionals is truly the heart of our business. Associates have a great knowledge and enthusiasm for cooking and each brings their own flavor and talents to the table, working together to bring you the very best shopping experience possible. They love to cook, experiment and play in the kitchen but when asked what their favorite part of working at the Shoppe is, everyone mentions their love for their co-workers, all of our customers and our community. 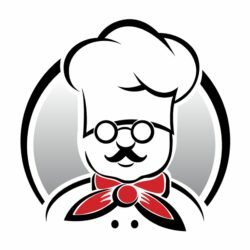 At Chef’s Shoppe, we truly are family and look forward to sharing our love for food and fun with you and yours! Lisa is our beloved shoppe manager! 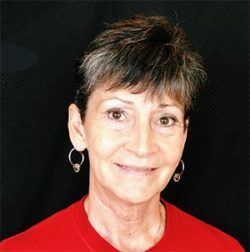 She is a reader, traveler, wine enthusiast, disco fan, and a retired competitive gymnast. How she manages to do it all so well we are still trying to figure out! Lisa loves her Cherry 7.25 quart Le Creuset Dutch oven and all of her “awesome co-workers”. 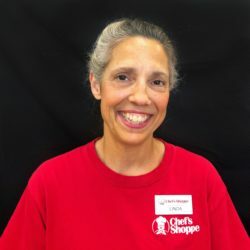 Lisa has been with the shoppe since 2016. 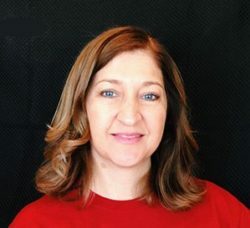 When she’s not rallying our team with that bright smile and positive attitude, you can find Lisa out in the sunshine living the lake-life with her family, gliding by on the water atop her stand-up paddle board, or with her hands in the dirt out in her yard. 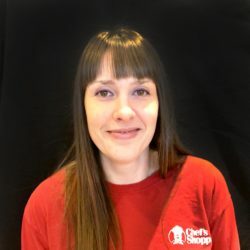 From keeping the shoppe stocked with awesome kitchen products, to discovering the newest gadgets you’ll love and need, Lisa truly enjoys everything about working at Chef’s Shoppe, especially her team. 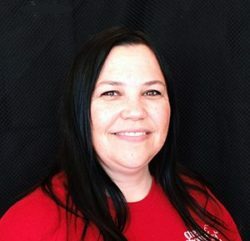 Debbie is always ready to help around the Shoppe, enjoys meeting all of the new customers and can answer just about any question you might have! If she’s not working, you can usually find her outside in her flowers or riding her bike. She especially loves the Le Creuset Dutch oven for baking breads. 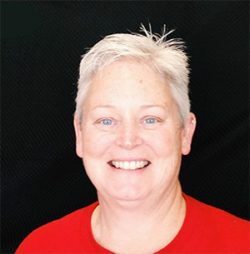 Lynn has been working at the shoppe for many years so we bet you’ll recognize her when you visit! 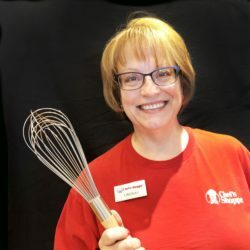 She previously practiced law for twenty years and now enjoys being part of the team at Chef’s Shoppe and cooking at home. Her favorite must-have item from the Shoppe is her All-Clad stainless steel French skillet. 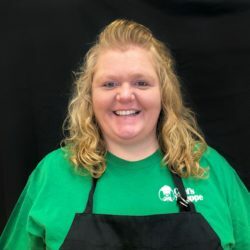 She’s loves trying new recipes and all of the gadgets herself, so be sure to ask her for a recommendation the next time you’re in! Sam is currently a student, and also volunteers at Partners for Pets in her spare time. She rather enjoys watching cheesy films and drinking cold brew coffee from the Primula cold brew coffee maker she got from the shoppe! Clearly, our Team Supervisor, Kenna, loves being a dog mom (just look at her mug!). 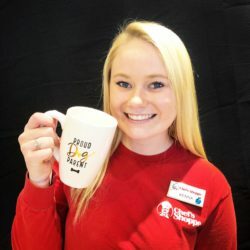 She has two miniature Dachshunds at home that help her relax after a long day of working hard at the Shoppe while also studying and attending school as a full-time student at SIUE. 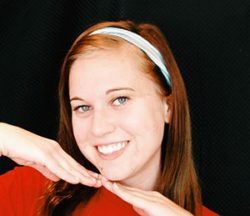 She’s quite the artist and you’ll most likely recognize those bright eyes and big personality from some of our fun videos. TJ is the shoppe’s Popcorn Master! 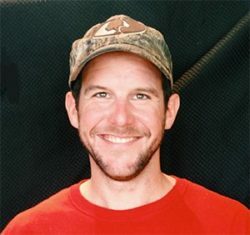 When he isn’t coming up with new popcorn flavors or being the shoppe’s resident handyman he enjoys fishing, camping, and tending to his fresh water fish aquarium. TJ is also a Big Green Egg enthusiast. He can whip up a home cooked meal for any girl in no time. What can we say about Chef Bob? He’s been with us since the very beginning, leading the team with his knowledge of all things culinary (you can tell by his big belly), and keeping his watchful eye over the shoppe day in and day out. He’s the first one to greet you as you enter the shoppe. Bob is our most solid team member and reminds us all to give our customers “Our Very Best” each and every day. 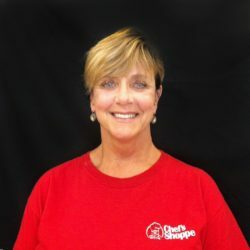 Rolla has been with the shoppe since in 2006! She loves to bake and often brings in goodies for the whole staff to try, which we LOVE! Her favorite item is the Swiss Diamond cookware. You’ll probably notice Lana’s bright and friendly personality when you’re in the shop. She’s been at the shoppe since 2016 and just loves the candy wall! When Lana isn’t helping customers find just the right cooking tool or sample fudge, she enjoys tutoring, creating wearable works of art with beads and reading (in as many as 5 languages). 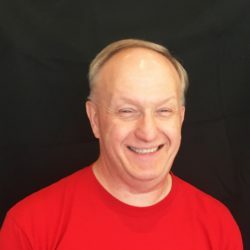 When Lou isn’t singing or telling his “Dad Jokes”, this semi-retired family man makes sure the shoppe’s shipping and receiving is running smoothly so our customers can explore our thousands of new items. When new inventory arrives from Lodge Cast Iron (his favorite brand in the shoppe) it’s like being a kid at Christmas for Lou! 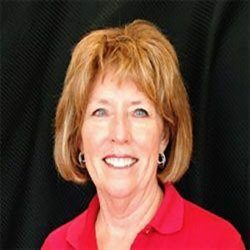 Becky has been with the shoppe since 2011. When Becky is not at the shoppe working, she spends her time as a full-time high school teacher. 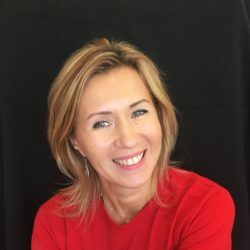 She is quite knowledgeable on classic literature, traveling three of the seven continents, and cooking. Becky enjoys using the USA Pan bakeware to make goodies for her co-workers. 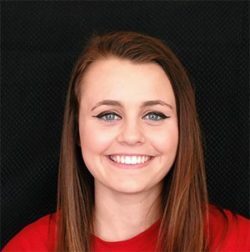 Autumn is currently a student at Southern Illinois University of Edwardsville. When she isn’t in class or working at the shoppe she enjoys watching Blues Hockey and taking pictures of her cat. She fears biscuits in a can and her favorite items in the shoppe are the double-walled thermal cups from brands like Tervis and Swig, because they keep her coffee “super hot” and her chocolate milk “super cold”. We’ve been lucky to have Linda’s years of experience in food production as part of our Popcorn Production Team since the 2017 Holiday season. 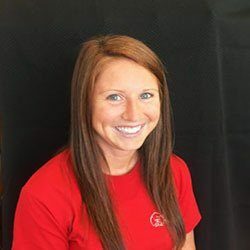 When she isn’t lovingly coating our small-batch Gourmet Popcorn with chocolate or cheese, you can find her trap shooting, training her dogs, or enjoying time with her children and family. Linda loves just about everything at the Shoppe, so don’t even ask her what her favorite is. 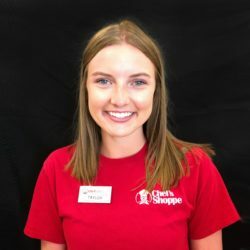 Katelyn has been part of the Chef’s Shoppe Team for a few years now and if you have a question about any gadget, gourmet food or gift, Katelyn is your girl! She loves cooking and knows her way around the shoppe, so be sure to ask her for help finding exactly what you need! She always goes the extra mile with a smile. 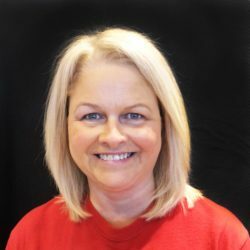 Janet has been helping you find exactly what you need at the Shoppe since 2017. From Popcorn to Coffee, Candy or Gadgets, she knows her way around, but the Big Green Egg is her favorite thing to share with customers. She and her family spend lots of time trying out yummy new recipes on her very own Egg at home. And although she claims she doesn’t have any hidden talents, we think she’s pretty great! One of our newest sales associates, Lindsay, joined the team in 2017, and she’s all smiles when sharing her favorite Gourmet Foods from Chef’s Shoppe with customers. She loves the great section of brands and the huge variety of flavors of dip mixes, marinades and more…plus, all of the free tastings! When she isn’t working, she loves painting, working around the yard, reading and spending time with her parents. We’re lucky to have this talented “Cheesecake Queen” making some of our delicious Fudge here at Chef’s Shoppe. Amy loves baking at home with her family and if you’re lucky, she might let you taste what she’s cooking up in her favorite product, the Staub Coq Au Vin! Linda has been a friendly face behind our fresh Fudge counter since Fall of 2017. She just loves helping people sample all of the flavors to find their new favorite. You may not know it, but Linda can read and write backwards! Plus, this awesome mom, gardener and baker has been teaching young adults with learning disabilities for over 30 years. Since the holiday season of 2017, our resident “People Person,” Kelly has been helping you find exactly what you want around the Shoppe. She really enjoys educating customers about the incredible selection of cookware we have, especially all of the beautiful colors of Le Creuset enameled cast-iron! 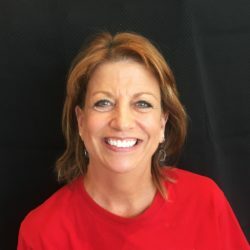 She jokes (well kind of) that her secret talent is “talking,” but when Kelly isn’t engaging with you here, you can find her relaxing with her dog, spending time with family or her two sons in California, stretching on her yoga mat, or just about anything outdoors. We’re grateful to have had this hard-working student on our team since 2017. Not only does Taylor currently study at SIUE, but she’s also a member of the Alpha Phi Sorority there. Her favorite place to be when she’s working is in our gourmet Popcorn Shoppe, and she gets extra excited when she can help you find that special gift or item you’re looking for!